The second chapter of my research into my 12th century Devon ancestors is complete. On national level it deals with the early reign of William Rufus, William the Conquerors son, and the transference of baronial lands. On a local level it deals with royal charters and grants of land from my ancestors to the family's local priory. "By the beginning of the 12th century the Normans began to introduce a system of reclamation with the aim of clearing and cultivating waste land. They achieved this by granting small estates on the edges of moorland to those who would make good the land by farming and the raising of stock. These new ‘landowners’ would become free-tenants. Once again, the remoteness of the Meavy settlement was an advantage, it enabled the family to prosper. In return for their ‘good fortune’ they would make gifts of food, money and eventually land to their local church, it is in this, the gifting of land to the Priory of Plympton, that we get our first mention of this ancient family going under the surname of Mewi. In a Charter dated 904, Edward the Elder granted land at Plympton to Asser, Bishop of Sherbourne in exchange for a monastery to be built at Plympton, this Anglo-Saxon collage housed a community of secular canons. According to the Domesday Book the college consisted of a Dean and four prebendaries. By 1121, the college's days were numbered, William Warelwast, Bishop of Exeter dissolved the collage in order to establish a house for Augustinian monks. This new build was Plympton Priory. Dedicated to St Peter and St Paul the priory is situated just seven miles south of Meavy." 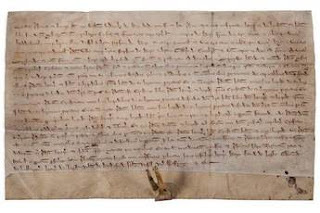 The image below is an example of a 13th century Charter dealing with land in Bere Ferrers in Devon that lies on the Rivers Tavy and Tamar, north of Plymouth, around the same time and in the same area as my Meavy family.